My first offshore trip with Ah Fong. Quite a nice guy and chatty too. He is very good at fishing!!! Also to test out my newly bought Accurate 270 with my lucky red line that I transferred over from my Avet reel. My lucky red line proved to be lucky once again. 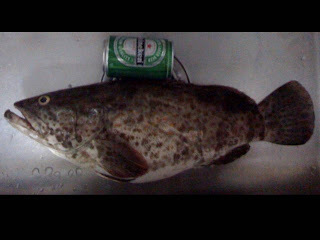 Landed a 2.5kg groupa together with few other catches. Total catch for the trip 27 pieces. I threw back an ACK cos I think its too small. 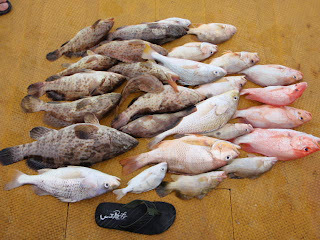 All Sengs and other smaller fishes were also thrown back. Very good catch from personal experience especially when he only has 1, yes 1 spot. We just basically circled 1 area near to changi beach and thats what we landed. 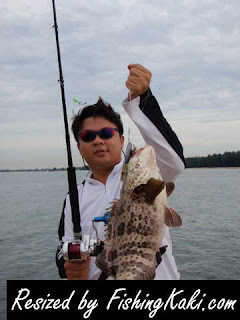 wow keith, great catch and fat gao in changi area. Outstanding. fillet big chunks cook beehoon. head n bones deep fried with pepper n salt n five spice powder, then add garlic,shallots,ginger n spring onions in n stir fried with wine. Yong... Yr recipe always very vague... Very hard to understand. I already cut the fish up. Spilt head with tummy into 2. The body, I fillet the flesh out on one side and the other side I kept with the bone. To cook beehoon, how do I marinate the fish chunks? If just throw in quite tasteless right? the chunks marinate with a little light soya sauce n corn starch. you stir fry it with sliced ginger n whole garlic till abit light golden brown. same wok with the gliced ginger n whole garlic,pour water in to boil,can add chicken cube,or some abalone soup base. prepare vegetables-Hong Kong choy sam n your Chor beehoon, tips put the vege-stalks in to boil 1st,Then add everything in and let boil and simmer small heat for 2-3 minutes, add brandy in for aroma. Can add ligt soya sauce if too bland.add carnation evaporated milk- 1 tablespoon,optional. sprinkle pepper, ready to be serve. serve with light soya sauce ,red chilli n minced garlic. you can also pre boiled fish bone,other fish bones also can to make your soup base. Hi,I am new to fishing. As far as I am concerned, you've got a great catch. Can you give me his numbers ? Hi, I am new to fishing, but as far as I am concerned, you 've got a great catch. BTW Can I have you boat man's number ? Hi westly. U have to contact Apollo from team Viii. He is the organizer. Anyway unless u r willing to do weekdays, ah fong is probably booked for the rest of the year.